Equipment: satellite TV; DVD; internet access Wi-Fi (included); washing machine; alarm system; gas central heating. Furnishing: rustic, good, well-kept, with some antique furnishings. detached house, 8 - 12 people, 6 room/s, 4 bedroom/s, 3 bathroom/s, approx. 220 m², 2 floor/s. Bedroom 2: (ground floor): 2 x single bed it is allowed to put together the beds, exit to terrace. Bedroom 4: (floor 1): 2 x pull-out bed, bunk bed. Dining area 2: (corner bench) in the living room, (floor 1). Kitchen: Kitchen/ cooking equipment: 5 gas rings, oven, microwave oven, dish-washer, combination fridge-freezer, coffee machine, toaster. separate (ground floor). Kitchenette 2: Kitchen/ cooking equipment: 4 gas rings, combination fridge-freezer. in the living room (floor 1). Living room: (ground floor): furniture suite, wood-burning stove (insert), exit to terrace. From the living room stairs to upper levels. Living room/bed room 2: (floor 1): furniture suite, double sofa bed. Access/parking: garage for two cars. Estate: (private use): approx. 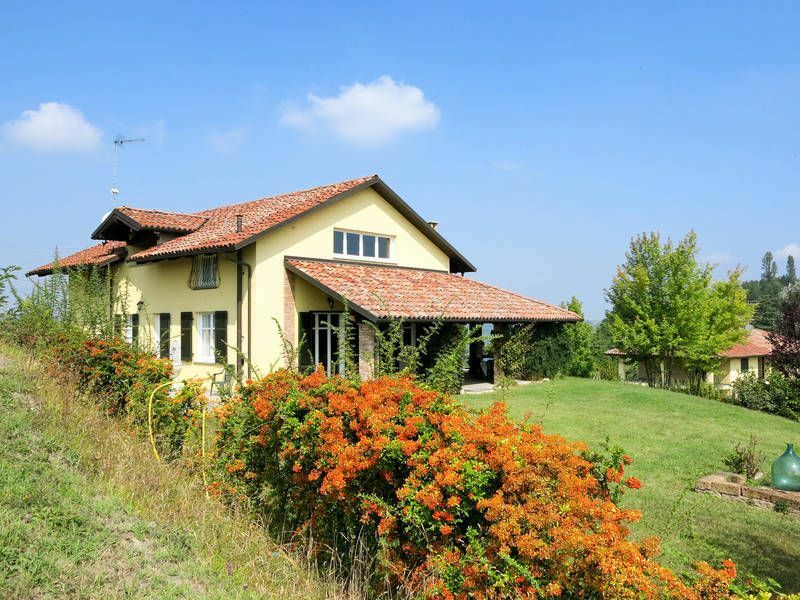 2500 m², partially self-contained (hedge), terraced, with plants, well-kept, garden, lawn, grapevines, fruit trees. Garden maintenance by the gardener 1 time/s per week. Outdoor facilities: (private use): terrace 60 m² (roofed), roof terrace, furnishing provided, transportable barbecue. Situation: rural, altitude 300 m, panoramic view. Arrival: Airport Torino in approx. 100 km. Train station Asti in approx. 17 km. Next village/town: Alba in approx. 32 km. Asti in approx. 17 km. Center Mombercelli in approx. 2 km. Public swimming pool: Public outdoor swimming pool in approx. 3 km. Shopping: Next shopping possibility (Mombercelli) in approx. 2 km. Next supermarket (Mombercelli) in approx. 3 km. Beautiful, private, peaceful and clean environment. Private, peaceful and clean environment. Magnificent view. Vineyards all around and even a vintner a few doors down the street. Find out when the village has their once or twice weekly food and wares market and you will be amazed. You'll need your own supplies (including TP, salt & pepper, etc. ), unless left behind by previous renters. The rest of the kitchen is well stocked. Carmen, who works for the owner, deserves a five and a half stars (if 5 stars is the best). She's attentive, kind and helpful; but, you'll never see her or be bothered by her unless you need her. The owner, though I never spoke with her, also seems to care about your stay (this I picked up by my dealing with Carmen).